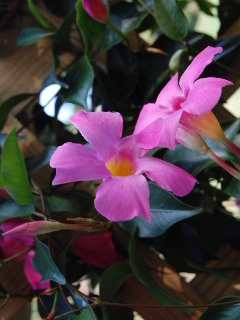 Mandevilla is an evergreen bushy shrub, native to South America. The plant is popular with gardeners because of its profusion of colorful trumpet-shaped blooms that keep producing a brilliant show throughout the spring, summer, and into the early fall. These red or pinkish blooms are also popular with hummingbirds. The leaves of the mandevilla plant are a deep dark glossy green and appear in just as great a profusion as do the blooms, provided the plant remains healthy and growing throughout the season. Regular feedings of a balanced mild plant food (I like Miracle-Gro) will push your mandevilla to achieve its maximum potential. The plant is a bold runner, producing plenty of tendrils that extend the size and shape of your plant to cover a fairly large area. 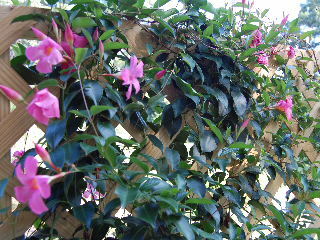 Provide some sort of trellis for your mandevilla to climb on, and train it as the new runners come on to help it expand and cover the trellis structure. As the plant runs and grows, new blooms will be produced on the new growth--resulting in a stunning visual display. The mandevilla can be planted directly into the garden or potted into a large enough container to insure sufficient room for root development. Be sure the planting medium is very well-drained by mixing a good amount of sand into the peat and potting soil mixture. Mandevilla does not do well with soggy roots, and the result can be a loss of your plant to the ravages of root rot. Also, remember that the mandevilla is very sensitive to cold and will not do well in temperatures below 50 degrees F.
If you plan to keep your plant indoors through the winter, cut it back and bring it indoors before the cool nights of autumn arrive. Sunlight is also critical to the vigor of your mandevilla plant and to its ongoing production of blooms. Outdoors during the summer, much full sunlight is needed, with some partial or filtered shade in the afternoon. My experience has been that, although the plant and its blooms look rather delicate, the mandevilla actually thrives under the heat and light of the full sun for most of the day. And as for indoor lighting over the course of the winter, try to position your potted mandevilla plant close to a window with southern exposure to capture that low-on-the-horizon elusive winter sunlight. Also, be careful to avoid positioning the plant too close to a heat vent.